I have been severely neglecting my own marathon and I beg your pardon. If you have followed me on my FB Page, you will know that I have been keeping busy, very very busy. Onto some yummy soup now. Winter in Hyderabad is pleasantly chill and the perfect time to whet the appetite with a bowl of soup. The array of winter vegetables makes soup making an enjoyable chore. Add a bunch of aromatics like fresh ginger, garlic or lemon grass, a dash of warming spices like nutmeg and bay leaves and you have a robust soup. 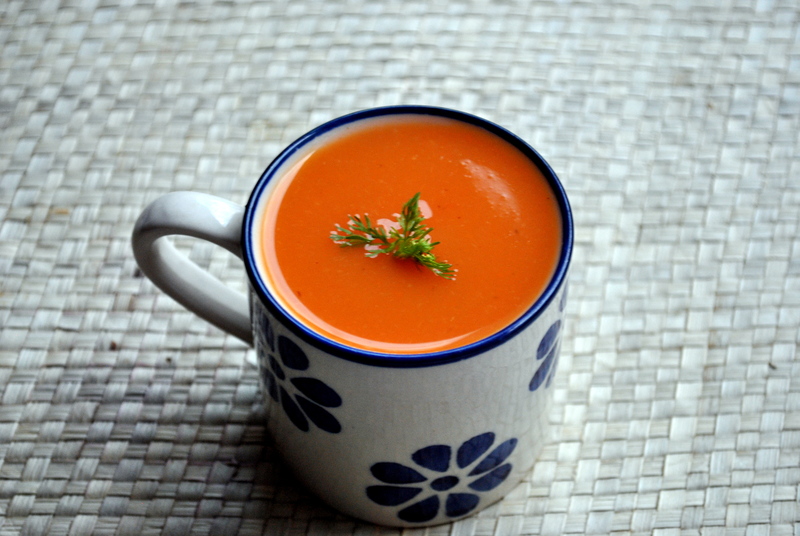 Carrots and Sweet Potato are an excellent combination for a soup. They have a natural sweetness which gets enhanced while cooking and the addition of garam masala imparts a nice kick to warm it up. Perfect for the winter months with the subtle sweetness of sweet potato and carrot, this delicious thick soup is nutritious and a great meal in itself. Serve with toasted bread and dinner is done! In a pressure cooker, warm the olive oil, saute the onion till translucent. Add the cumin powder half the garam masala and fry for a minute,stirring. Add the celery, cubed potato and carrot and saute till they are beginning to get a few golden edges. Add the water and the stock cube, half the salt and close the lid of the cooker. Cook for 2 whistles on high heat, reduce heat and cook for 5 minutes. Turn off the heat and allow the pressure to release. Open the cooker, drain the vegetables out with a strainer, add to a blender and blend till creamy. Now add the pureed vegetables to the broth, simmer on a low flame, taste for salt and adjust. Add freshly ground pepper and the rest of the garam masala. Serve hot with toasted bread.